ORLANDO, Fla. -- This time, the shot fake drew Paul Pierce off his feet (instead of the other way around). And when Pierce came back down, he absolutely hammered J.J. Redick. But Redick bounced up like a pogo stick, uninjured, undaunted and undeterred. In a way, it was an analogy for what happened Wednesday night and what is happening in the bigger picture in the Eastern Conference finals -- the Orlando Magic are back on their feet. "The ball swung to me and I figured he was going to jump out in the passing lane, because it was kind of a rotation play where I would swing it to MP [Mickael Pietrus]. So he bit a little bit and I got him up in the air, and he came down on me pretty hard and made sure I didn't get a shot off," Redick said. "No. When Shaq hit me earlier in the year, that hurt." All the hurt Wednesday night was being felt in the Boston Celtics' locker room, where Glen Davis and Marquis Daniels were feeling the effects of concussions, and Kendrick Perkins was realizing the gravity of what he had done -- earning himself an automatic suspension (unless one of his techs is rescinded) for Game 6 on Friday night after picking up his sixth and seventh technical fouls of the postseason. Suddenly the Celtics are bearing little resemblance to the mean green machine they were in Games 1, 2 and 3, and the Magic are no longer the team that's reeling. This 113-92 thumping of the Celtics represented Orlando's best overall game of this series, as the Magic started looking again like the team that rolled through the first two rounds of the playoffs undefeated. "Just another great effort, and obviously offensively we were a lot better," Redick said. "We've played the last six quarters very well offensively; we've pretty much figured out what works against them and what doesn't, so that makes a huge difference." Orlando had its best 3-point shooting game of the series, going 13-for-25, with Jameer Nelson leading a more balanced attack than the Magic had in any of the first four games with 24 points. Dwight Howard added 21 points, 10 rebounds and five blocks, even knocking down half his free throws when the Celtics began intentionally fouling him with about seven minutes left in a last-ditch effort to climb back. As it was, Boston played from behind for most of the night. 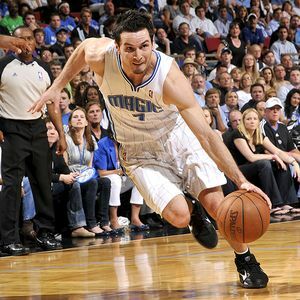 And it was Redick who keyed the early surge that put Orlando ahead for good, scoring 11 of his 14 points from the moment he checked in, with the score 16-16, until he was subbed out with the Magic ahead 49-37. Boston got the deficit down to five early in the third quarter, but Matt Barnes hit a 3 off an offensive rebound -- Boston coach Doc Rivers called it the biggest shot of the game -- to turn the momentum back Orlando's way. "You know, they are a great team when they get a lead, because then those 3s are easy," Rivers said. "And I thought we never applied any real pressure to them in the game tonight. I thought we made runs, but no real pressure. For us it's real difficult to score when you're taking the ball out of bounds [after a make basket] every single time." Aside from whatever mental damage might have been inflicted on the Celtics, the physical cost was immense. Davis resembled Mike Tyson against Buster Douglas as he tried to get back on his feet after Howard inadvertently hit him in the face with a forearm as the two battled for a rebound. Daniels also sustained his concussion in a scrum under the basket, and then there was Perkins. He was ejected from the game with 36 seconds left in the first half by referee Ed Rush for gesticulating and swearing after he was whistled for his third foul. Earlier in the quarter, Perkins and Marcin Gortat were issued double technicals by Rush for their extracurricular activity after Nelson fouled Pierce. Perkins' elbow struck Gortat in the chest after he first reached down to help Pierce up, although replays were inconclusive as to whether it was intentional. "I was trying to listen to what [Pierce] was saying because he was complaining about something. I know that Perkins got the technical foul for an elbow, he elbowed me in the chest. It was in the middle of the game, it was OK," Gortat said. Was the double technical justified? "That's a referee's decision. I don't have anything to say about it. We knew it was a pretty tough referee [crew], so it's OK," Gortat said. Pierce said Game 6 will be the Celtics' own Game 7, but that comment should be taken with a grain of salt since Boston already knows it can win in this building, having done so in Games 1 and 2. Then there's the historical data that skews Boston's way, with the 93 teams that have taken 3-0 leads in a best-of-seven series having gone on to win the series 93 times. Orlando is only the 10th team in such dire straits to force a Game 6, and only three teams have forced a Game 7 after dropping the first three contests. "After we got down 3-0, it was like either we were going to give in or keep fighting. And everyone made a commitment that night that we're going to go hard and believe in each other," Howard said. Said Nelson: "At this point we believe we can win the series. We have to stay humble and remember what we've done to win these last two games. I believe they have the pressure on them now, but they're a veteran team with Hall of Famers and a great coach, so they'll be prepared." But there might only be 11 of them, and a couple of those 11 might still be feeling some post-concussion wooziness. The wooziness factor of that comes from failing to close out an opponent when the opportunity was there (see the final 16 seconds of Game 4, when the Celtics disdained to call a timeout to set up a final play with the score tied) could be a factor in the Celtics' heads, too. But at this point, for the first time in the series, the pressure will truly be on both teams to get the job done in Game 6. "Momentum is a funny thing. You can talk about it, but they can come out in the first half of Game 6 and kick our butts, so we have to battle; we have to go with the mindset that it's another Game 7, another elimination game," Redick said. It won't be an elimination game for Boston, but it might feel like one. The last place they want to be Sunday is back here in Orlando, trying to avoid the dubious distinction of becoming the first of 94 teams to blow a 3-0 lead and lose a series. "I still look at it like we've climbing a huge mountain right here, but we are playing better. We'll have to go up there and play even harder and even better in Game 6," Magic coach Stan Van Gundy said. "I don't think we've ever thought this is a team we can't play with. Clearly when you've won a couple games, you feel better about yourselves and your confidence level goes up. But I don't think that means the other team's confidence level goes down at all." On Friday night, we'll find out if he's right. Chris Sheridan is a regular contributor to the Daily Dime. ORLANDO, Fla. -- Celtics reserves Glen Davis and Marquis Daniels both suffered concussions during Wednesday's Game 5 of the Eastern Conference finals against the Orlando Magic at Amway Arena. Davis endured an inadvertent elbow to the face from Orlando's Dwight Howard after Nate Robinson blocked Howard's layup attempt from behind late in the third quarter. After lying on the floor for a moment, Davis sat up, dazed, and stumbled as he tried to get to his feet. On his second attempt to get up and run down the court, he once again wobbled, this time falling into the arms of referee Joey Crawford near midcourt. ESPN.com writers and TrueHoop Network bloggers chatted with fans and gave their in-game opinions throughout Wednesday's game -- all in Daily Dime Live. As we have found out in the past two games, Boston's Rajon Rondo isn't the only point guard in the series with serious game. Nelson tallied 24 points, five rebounds and five assists in the Orlando victory. Even the player with the best-looking shot in the league misses from time to time. Allen knocked down only three of 11 attempts, finishing with nine points. "We just all believe. We all believe. We know we can do it." • See Wednesday's daily leaders. • Game 5 preview: Can the Suns stay hot? With Vince Carter struggling for the second straight game, the Magic turned to J.J. Redick. He didn't disappoint, scoring 14 points on 3-for-6 shooting in 22 minutes of action. Rashard Lewis having good, efficient scoring performances is often tantamount to the Magic winning games. So when he came out with three straight disastrous performances to begin the Eastern Conference finals, it wasn't a huge surprise that Orlando saw itself on the brink of being swept. Even though Lewis had his lowest-scoring season in 10 years (14.1 points per game), Orlando typically won games when he was shooting the ball well and acting as a threat on offense. In the 52 wins Lewis participated in during the regular season, he made 45.9 percent of his field goal attempts. In the 20 losses he was a part of, he connected on just 37.2 percent. And during the playoffs this year, Lewis was on fire from the field, making 54 percent of his shots heading into the series against the Celtics. Going into Game 5 down 3-1, Lewis had made only 29.4 percent of his field goal attempts. With the Magic up by nine points heading into the fourth quarter, Lewis was having a mediocre scoring game, with foul trouble limiting his opportunities. He had just five points on four shots and hadn't scored since the 7:46 mark of the first quarter. Orlando was able to fix his scoring drought and secure the win by feeding the ball to Lewis against much smaller defenders. He scored three times against Paul Pierce in the fourth quarter alone and took advantage of a post-up against Marquis Daniels in which he was fouled and a defensive lapse in transition that left Rajon Rondo guarding him. Orlando did a good job of exploiting fourth-quarter mismatches against Boston that were caused by foul trouble, head injuries and ejections. They made sure Lewis scored often and efficiently. For Orlando, this usually results in a victory. To read more from Harper, click here. 8. More Trouble For Perkins? ORLANDO, Fla. -- Celtics center Kendrick Perkins was hit with his second technical foul with 36.1 seconds to play in the first half of Wednesday's Game 5, earning an automatic disqualification. Perkins earned a double technical with Marcin Gortat with 2:15 to play in the half after landing an elbow on the Magic's reserve center. Then, with 36.1 seconds left, Perkins and Dwight Howard were jostling in the post and Perkins was whistled for his third personal. He outstretched his arms and protested the call as he turned away from referee Eddie F. Rush, who apparently decided he went too far. Rush called the technical and Perkins looked on with an expression of stunned disbelief, then slowly shuffled to the other end of the court and eventually through the tunnel to the Boston locker room. • Dwight Howard registered 21 points, 10 rebounds and five blocked shots to help Orlando avoid playoff elimination in Game 5 on Wednesday night. Howard had 32 points, 16 rebounds and four blocked shots to help Orlando avoid a series sweep in Game 4. Only one other player has recorded 20 or more points, 10 or more rebounds and at least four blocked shots in consecutive games with his team facing elimination in both games: Elvin Hayes in 1979.